It is easy to underestimate Amla Ruia. But at 71, this mild-mannered Mumbai matriarch is one of the most prolific dam builders in the world, and at the forefront of India's fight against drought. Each year more than 300 million people in India have to battle severe water shortages. In recent years when the monsoon rains have been disappointing the government has been forced to deliver water to farms and villages by trains and tankers. People have died from dehydration because of the distance they had to travel in order to get to the nearest well. 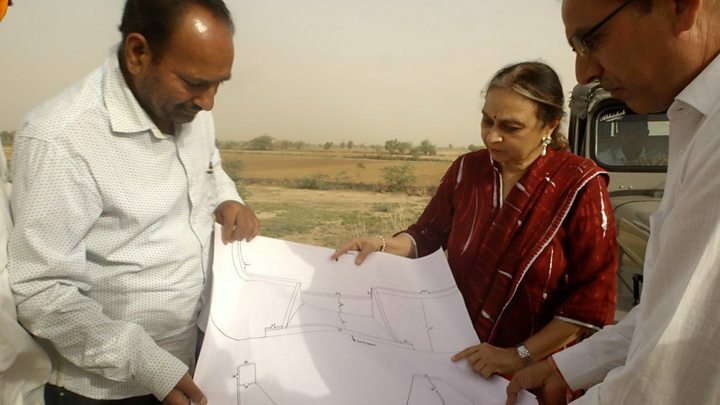 India's biggest state, Rajasthan, is also one of the driest, and it's here that Amla Ruia and her Aakar Charitable Trust have been working. Over the past 10 years they have built more than 200 "check dams", transforming the lives and livelihoods of more than 115 villages, and affecting another 193. The trust works with local communities to find parts of the landscape that can capture water, like a reservoir. Instead of building man-made reservoirs from scratch, they use the natural contours of the hilly landscape, building slopes, and shoring up spaces, to catch and keep water in these semi-natural basins or check dams. When the monsoon comes, the check dams fill up and replenish the water table which has dangerously degraded over time. The aquifers and wells near the villages retain the water for the dry season. They are cost effective, and unlike major dams and reservoirs, there is no mass displacement of people when they are built. "This is not a new solution, this was practised by our ancestors," says Amla Ruia. "The structures we make have a concrete wall only in the middle, so when the water level increases it can easily overflow from this side," says Aakar Charitable Trust engineer Drigpal Singha. "Other walls are made from earthen bunds, and the bed is just normal soil, so as you can see, it's all soil. "When it gets filled up the water directly seeps into the soil and recharges the water table, and brings up the water level in all the nearby wells." he says. The trust provides 60% of the resources for each check dam, and they ask the local community to provide the remaining 40%. Because the check dams need to be maintained they say that this level of community investment makes the villages and farmers take ownership of the dams, and so when the trust moves on, the benefits remain. "The villagers were not ready to believe in us. They thought we had some ulterior motive," Amla Ruia says about the days when they were first starting. The trust claims the impact on lives has been dramatic. Where they were taking deliveries of water from tanks to survive, farmers are now growing up to three crops and keeping cattle. Amla Ruia says young girls are able to go to school instead of having to stay home because their mothers have to go long distances to find water. Each year Aakar Charitable Trust, along with local communities are building an average of 30 dams, but Amla Ruia wants to triple this to 90 builds a year. She also wants to spread the word about check dams around the world. But it's not a solution for everyone, as local water activist Prafull Kadam points out. "These check dams will be very beneficial for locals here, and in future it will help the seasonal crops. "But it has limitations also. This innovation can't be applicable for the whole of India because India has different geography," he says. But that's not stopping Amla Ruia. "I told my husband once that I will continue to look after my check dams till I am 90. He said 'what will you do for the next 30 years? You are going to continue to work until you are 120'."